The Doberman Pinscher is known as one of the most effective guard dogs in the world. Once bred for the sole purpose of being a watch or protection breed, today’s Dobermans are being bred with more versatility in mind. Today, the Doberman Pinscher is used for search and rescue, police work, and is a loyal family companion. There was a time when Dobermans were bred with the intention of creating an aggressive breed, which led to a reputation that still precedes them. A relatively young breed, first being seen around 1900, the Doberman Pinscher dog breed was created with a melting pot of different breeds that include the Old Shorthaired Shepherd, Rottweiler, Black and Tan Terrier, and the German Pinscher, among others. The Doberman Pinscher was first bred by a man named Louis Dobermann, a German Tax collector, who wanted a guard dog that was also a suitable companion. The reputation of the Doberman would make you think they are all just nasty Junk-Yard dogs, but it is untrue. The breed is being bred with a less aggressive temperament in mind, making them a much more suitable pet. If you are looking for an alert, imposing, but great family pet, the Doberman Pinscher is a good pick for you. Keep in mind, that the Doberman Pinscher is still one of the most powerful and protective breeds in the world, so socializing them with kids, other people, and other family pets as a puppy is vital to avoid issues as the dog grows. What you can expect with a Doberman is a dog that will share a close bond with its family, and will never come up short on showing its affection. The Doberman Pinscher is not an overly sensitive breed, but there are certain things to be aware of. Because it is such an affectionate breed with its family, the Doberman hates to be left alone often. If you are getting a dog that will be left at home all day without human contact, this is not the dog breed for you. This dog has a short coat, so will not do very well with cold temperatures. They are a large breed that will do better with a large living area as opposed to an apartment or condo setting. The Doberman has been known to have some health issues, but with proper knowledge of a puppy’s heritage, many can be avoided. Some of the issues to watch for are Von Willebrand’s Disease, a blood disorder that causes excessive bleeding. Another issue to be aware of is Wobbler’s Syndrome, which is a genetic issue caused by the compression of the spinal cord. Again, making sure there is no history of these issues in a Doberman puppy’s bloodline is a good way to protect you from getting a dog with these issues. The Doberman Pinscher is one of the smartest breeds in the world, so any motivated owner, even a novice one, should be able to effectively train this dog breed. But, here is the other side of the coin, it is also a dog breed with a strong will and is a very powerful dog, so it is vital that it is trained properly, which may make it a better fit for a more experienced owner. Either way, it is recommended that any owner attend some sort of obedience training with their Doberman Pinscher. The Doberman is a relatively easy breed to groom, since they have a short coat with minimal shedding. It is recommended that you brush your dog’s teeth once a week, and trim your Doberman Pinscher’s nails once a month. The Doberman Pinscher is a very energetic and playful dog breed. They are a larger breed, so will not have the stamina of say, a Blue Heeler, but they will be intense and give it their all until they get tired. Daily exercise of this dog breed is highly recommended. A full size Doberman Pinscher will weigh between 60 and 90 pounds and will stand between 24 and 28 inches at the withers. There is a life-size statue of a Doberman in the war dog cemetery of the Orote Point US Naval Base in Guam. It’s a permanent monument with a plaque that reads “Always Faithful” and serves as a memorial to honor the military dogs buried there. A protective instinct paired with loyalty, alertness, and more all go into making a dog a good guard dog. 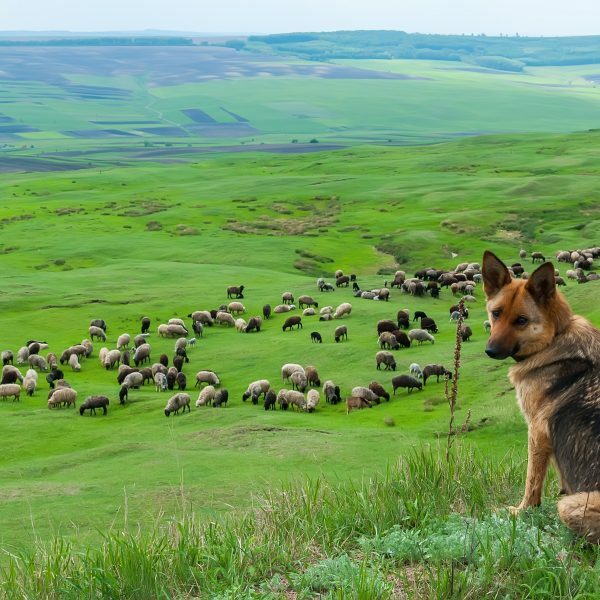 Here are 7 dog breeds that are good guard dogs. The Doberman Pinscher is a breed of dog originating in Germany. The American Kennel Club recognized this breed in 1908. This muscular dog is fast, energetic, obedient, and loyal. The Doberman Pinscher needs someone who will lead them and confidently show authority over them. They are very intelligent and have been used in many areas such as military and police work, search and rescue, therapy work, and more. Minimal grooming is required for this breed. With proper training, this affectionate dog can be a great match for the right person.